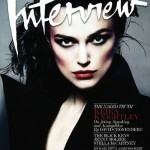 Famous British actress Keira Knightley looks incredibly beautiful in a tailored jacket in her last shot for April 2012 Interview Magazine. Thanks to Photographers Mert Alas and Marcus Piggot, the beautiful actress looks dramatically and stylish in these black and white photos. In fact, she is promoting her new movie – Seeking a Friend for the End of the World – out in theaters June 2012. In addition, the magazine features the Collections of Louis Vuitton, Balenciaga, Diane von Furstenberg и Yves Saint Laurent here. Meanwhile, Keira has two movies scheduled for release this year so you we’ll be to see a lot more of her soon. In my opinion, the actress radiates a kind of special softness, warmth and sincerity, which is rare. And I also like the great working capacity of this young talented actress and the ability to choose good quality roles. And perhaps, best of her roles was in the movie “Real Love”. Very nice, kind, soulful movie. Kira does not have a major role, but she looks great there, along with more famous actors. Well, she has played in tens of films, and in all of them she was perfect. At least I do not remember bad films with her participation.